2008 November: Barack Obama elected president of the United States. In one of the first moves, the new administration launches a broad review of the nation's space program. 2010 February: The White House cancels the effort to return astronauts to the Moon by 2020. 2014: Russia annexes Crimea, triggering a bloody conflict in Ukraine and Western sanctions against Moscow. Status and direction of the Russian space program during a period from 2010 to 2019. 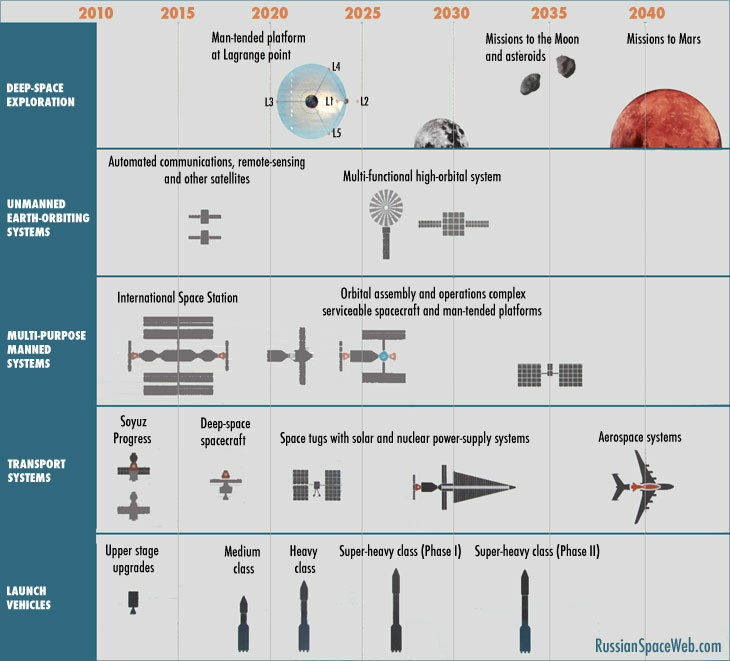 A timeline unveiled by the Russian space agency in 2013 outlining general direction of the Russian space program. Thanks to government subsidies, the Russian space industry weathered the 2008-2012 economic crisis relatively unscathed. During 2012-2015, the Russian government promised to invest 650 billion rubles into the space industry. (According to the data released by the Ministry of Economic Development in September 2012, a total of 590 billion rubles was promised for the Russian space program during 2013-2015). By the end of 2012, the Russian government promised to spend 2.1 trillion rubles (including non-federal funds) before 2020. 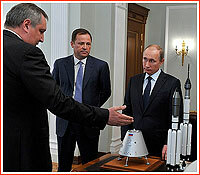 In April 2013, President Putin quoted 1.6 trillion rubles ($51.8 billion) to be spent on space program until 2020. The revival of the GLONASS navigation network and the construction of the new launch site in Vostochny were often quoted as the biggest space budget items. Despite a steady growth in the first half of the decade, the space spending was under repeated assaults by the Finance Ministry during budgetary planning, prompting several letters from Roskosmos to the Russian president. On December 15, 2012, the Russian government approved the latest revision of the Federal Space Program, which covered a time period from 2006 to 2015 and was previously updated in March 2011. The program reportedly doubled the budget for communications and remote-sensing satellites by shifting funds from other programs. This change in priorities would enable Roskosmos to deploy 95 satellites by 2015 and a total of 113 spacecraft by 2020, the head of the agency said. According to the Izvestiya daily, launches of 20 spacecraft were pushed beyond the scope of the program ending in 2015, nine missions were canceled altogether, and 10 new projects were initiated. In parallel, in January 2013, Roskosmos officially presented to the government a draft of the "State Program" entitled the "Space Activities of the Russian Federation in 2013-2020" with a total price tug of 2,120 billion rubles. 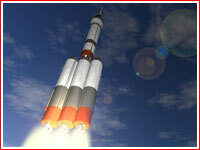 The document also contained "foundations" of a space strategy extending until 2030. The responsibility for the accomplishing the goals proclaimed in the new strategy was shared between Roskosmos and the Ministry of Defense. 10 other ministries, including atomic agency, Rosatom, also participated. Echoing previous documents, the policy declared space access and application projects a top priority for the agency, placing scientific missions to the second place in importance and relegating manned missions to the bottom tier. The proclaimed goal of the program called for the increase of the Russian share in the world's space industry from 10.7 percent in 2011 to 14 percent in 2015 and 16 percent in 2020. In case of a formal approval of the January 2013 document by the Kremlin, Roskosmos would find itself with two overlapping strategies to follow (if not two budgets to finance same projects) until at least 2015. Observers explained such a strange situation by an attempt to camouflage the failure to fulfill the goals of the earlier document ending in 2015 with new declarations in the latest strategy with much more remote deadline of 2020. Such tactic was known as "running on the shifting sand." According to the officially proclaimed policy, Roskosmos was directed to make the latest strategy public, sans parts dealing with sensitive military and commercial secrets. Yet, the document posted on the agency's web site on Jan. 12, 2013, was widely decried as making mockery of informing Russian taxpayers. The vaguely phrased 10-page paper contained practically no new information on the program and also revealed factual errors and major omissions. Slightly more information was contained in the new revision of the document published in May 2013. 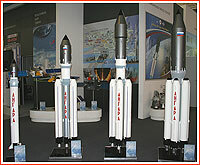 Since rockets always form the foundation of any independent space program, the agency's commitment or lack of thereof to the development of new launchers illustrated the pace and scope of the Russian space program. As before, upcoming goals were grouped into time periods before 2015, before 2020, before 2030 and after 2030. 110.0 billion for capital expenses. In April 2015, as the Russian economy contracted by two percent, the proposed budget for FKP-2025 was slashed by 800 billion rubles from 2,849.4 billion (counting the latest devaluation of the ruble) to 2,004 billion rubles. During the same period, Roskosmos hoped to earn 1.8 trillion rubles, mostly with profits from commercial launches, satellite communications and space tourism. A number of long-term projects in early stages of development was canceled. Financial problems for the Russian space program continued into 2017. Going into a three-year budget period covering 2017, 2018 and 2019, the government cut a total of 58.8 billion rubles ($1.02 billion) from Roskosmos' budget. At the same time, the Ministry of Finance also insisted that the resulting budget would remain flat at the 2017 level of 86 billion rubles ($1.49 billion) per year for the entire three-year period, Roskosmos sources said. An extra six billion ($104 million) was added to the 2018 budget only after some negotiations between space officials and the government. These extra moneys allowed Roskosmos to begin the development of the new-generation Soyuz-5 launch vehicle and to continue a few other previously stalled programs. However, there will still be a gap between the official cost of formally approved projects and the actual budget available to Roskosmos in the next two years, industry sources said. 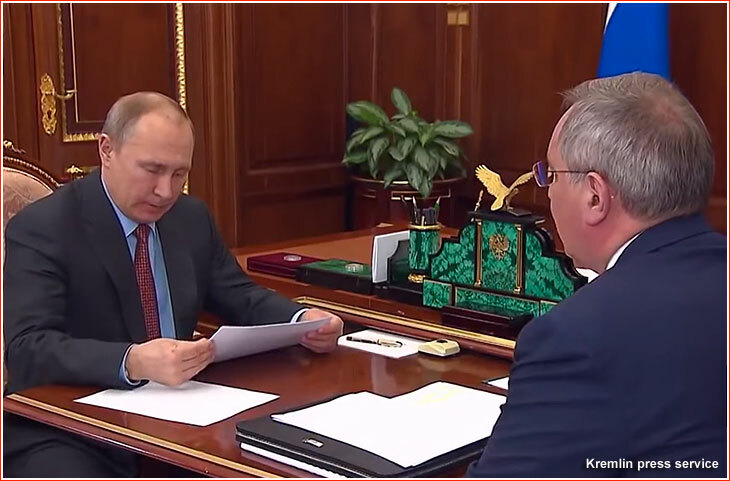 Vladimir Putin reviews financial indicators of the Roskosmos State Corporation during a meeting with Dmitry Rogozin on Feb. 4, 2019. During a government meeting on Jan. 23, 2019, Prime Minister Dmitry Medvedev said that the planned budget for Roskosmos for the upcoming three years would be more than 515 billion rubles ($7.77 billion). According to the revealed data, even with all the federal and military contracts, Roskosmos ended up $400 million in the red in 2016 and 2017, but the State Corporation was estimated to be back in a positive territory in 2018. 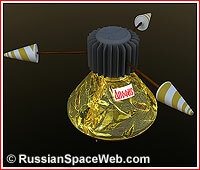 In the meantime, one well-informed source told RussianSpaceWeb.com that Roskosmos had been bracing for a shrinking of the space industry by as much as 30 percent due to severe budget cuts. As of 2016, a separate Federal Program for the development of three Russian spaceports called for a 750-billion-ruble ($13 billion) budget from 2016 to 2025. Baikonur would cost 50 billion rubles ($868 million), Plesetsk would take 180 billion ($312 million) and Vostochny would consume more than 500 billion ($8.68 billion). However the final program deferred all the efforts to bring launches of cosmonauts to Vostochny until the completion of the development of a super-heavy rocket at the end of the 2020s. Despite improved funding, the reality showed that money couldn't buy everything. Typically for the Russian economy, the nation's space sector continued suffering from the aging work force, brain drain and inefficiency. On April 26, 2012, Roskosmos, published a presentation, providing details about the nation's space strategy, which was officially approved by the agency behind closed doors back on March 6, 2012, and submitted to the Kremlin and other federal institutions. The document was prepared by a working group led by former head of Roskosmos Yuri Koptev, Roskosmos announced. The public outline painted in rather uncertain terms a broad and mixed picture of Russian goals in space all the way to the year 2030. The first phase of the plan extending to 2015 was highlighted by a practically impossible to fulfill promise to build a new Vostochny launch center. 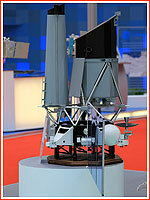 By 2020, a new-generation rocket complex would have to be "deployed" at Vostochny -- yet another unreachable goal. (From 2012, it essentially meant building a launch pad for the Angara-5-based rocket in Vostochny under a code-name Amur.) Around the same time, the new-generation manned spacecraft would have to be developed, the presentation declared, again, contrary to realistic expectations for such a complex undertaking under current conditions. The Russian "participation" in international missions to Venus, Jupiter and asteroids was listed, without specific launch dates. During the next phase, extending to 2030, a super-heavy rocket, like Angara-100 or Yenisei-5, would have to be deployed in Vostochny, supporting manned Moon landings, along with a variety of missions within a "full range" of Earth orbits. In parallel, serviceable spacecraft of unspecified purpose were promised, along with unmanned missions to Mars, Venus, Jupiter and Saturn. Missions to remove space junk from space and mitigate threat posed by asteroids would also be possible, the document said. Within a range of priorities quoted by the document, application missions were pragmatically placed at the highest level, with manned transport systems, including reusable rockets, occupying a second tier in importance, while the development of the internationally sponsored manned mission to Mars and a new-generation manned space station were both left at the third level. Despite its vague wording and hefty proclamations, the document clearly highlighted the effort by the current leadership at the agency to steer the industry toward more pragmatic goals than prestige-oriented projects inherited from the Soviet period. The latest strategy clearly echoed previously voiced concern of the Roskosmos' leadership about the need to reform the industry, which was heavily skewed toward manned space flight (with 58 percent of overall space funding going to manned sector), at the expense of application and science missions. At the same time, the agency apparently still had no choice but to confirm its commitment to a costly and mostly politically motivated enterprise to build a new launch site in the Far East. Given low priority of ambitious manned projects and the virtual absence of funding for a heavy-lifting launch vehicle, the yet-to-be-built launch site threatened to turn into another painful and endless sacrifice to the political altar. In October 2012, Roskosmos started the 628.8-million-ruble ($18.8 million) Strategiya and the 726-million-ruble ($21 million) Programma projects, which aimed to develop the federal space strategy until 2030. Both contracts went to a single bidder -- the agency's own TsNIIMash research institute, which led a similar Magistral and Magistral-2 studies during the 2000s. The latest work was completed in May 2013 with the approval of the formal doctrine entitled "Policy foundations in the field of space activities for the Russian Federation until 2030 and beyond." The change of leadership at Roskosmos in 2013 apparently marked yet another zigzag in the agency's strategy. On Dec. 27, 2013, Roskosmos announced two new tenders -- 883-million-ruble Strategiya-2 and 968.8-million-ruble Programma–2 -- with a total price tag of almost 2 billion rubles ($60 million) for the development of its strategic documents until 2030. The "winning bid" was to be "selected" on Feb. 13, 2014, and, again, the agency's TsNIIMash was expected to be an inevitable receiver of hefty funding extending until Nov. 25, 2015. However this time, the announcement of the "tender" attracted a critical attention of the Russian public and even of the semi-official press. The newly appointed chief of the agency Oleg Ostapenko, the third space boss since 2011, was quickly blamed for wasteful spending. Although some of the arguments made in those articles were somewhat misguided, they did make a rare criticism of the agency's inefficiency, despite all the money thrown at it in the past decade. By 2013, Roskosmos drafted a very preliminary roadmap toward the development of the heavy and super-heavy launch vehicles. Not surprisingly, it matched closely the strategy that NASA had followed since 2011 within the Space Launch System, SLS, project. Speaking at the meeting on the prospects of the Russian space program chaired by president Vladimir Putin in Blagoveshensk on April 12, the head of Roskosmos Vladimir Popovkin said that the agency had been conducting the study (known as Magistral) into the launch vehicle with a payload of 75-80 tons and whose "open architecture" would enable to upgrade it later to carry up to 120-130 tons into the low Earth orbit. Whether the Russian government would endorse, let alone fund such a plan, remained unclear at the time. Still, TsSKB Progress, RKK Energia and GKNPTs Khrunichev were known working on alternative proposals. Traditionally, manned space flight remained one of the strongest areas of the Russian space program, taking at least 50 percent of the space budget. During its 10-year space budget from 2006 to 2015, Russia reportedly spent 186.6 billion rubles for the ongoing assembly and operation of the International Space Station, ISS. With improved funding in the second half of 2000s, Russian government started planning new goals for its cosmonauts, largely reflecting US efforts, including lunar expeditions. However, in February 2010, the Obama administration proposed to cancel the plan to return to the Moon within the Constellation program. The move could have major implications for other space-faring powers, first of all Russia and Europe, for years to come. Russian space officials hurried to re-affirm the public that the crisis in the US would have no effect on the the nation's long-term plans. However, an overly ambitious program by Roskosmos to build a new launch center, introduce a whole new type of rockets in 2015 and a next-generation manned spacecraft in 2018 looked less and less realistic. Critics questioned the wisdom of committing to a decade-long development program, instead of upgrading the existing Soyuz spacecraft for lunar missions, which could be accomplished within few years. Even RKK Energia, the country's main and only manned spacecraft developer, was weary of the agency's grandiose space plans. During 2010 and 2011, the company tried to convince Roskosmos to limit the mass of the next-generation spacecraft to 12 tons, thus enabling its launch on a medium-class vehicle based on the existing Zenit rocket and launch facilities in Baikonur. The company was also quietly seeking commercial collaboration with an emerging crop of manned spacecraft developers in the US. In the meantime, the partners involved into the ISS project faced a difficult dilemma: where to go next in space with limited funding available to space agencies on both sides of the Atlantic. Although the ISS was given the green light to operate until at least 2020, decisions about the future would have to be made well in advance, particularly, if space agencies wanted to join forces in an effort to expand human space flight beyond the Earth orbit. In the absence of a bold commitment to go to the Moon, Mars or asteroids, space planners in the US and Russia considered sending missions to the so-called Lagrange points, which could serve as staging hubs for deep-space exploration, if such projects ever became affordable. In the meantime, inside Russia, there were first signs that the manned space flight was no longer an untouchable holy cow. In 2011, the newly appointed head of the Russian space agency Vladimir Popovkin first warned that the national space program had overemphasized manned missions. This attitude was echoed by the Kremlin in August 2013, when the Russian Vice Prime Minister Dmitry Rogozin told Vesti-24 TV channel that Roskosmos officials had had to learn how to answer question what (manned space flight) was for. "If in the past we were launching cosmonauts to prove the world that they could work in orbit for a very long time, now, we have many other practical applications in unmanned space flight that we ought to pursue," Rogozin said. Russia's most neglected field of space exploration had to essentially make an attempt at rebirth during 2010s. Beginning in 2011, Roskosmos promised to launch long-delayed probes to Mars, Moon and Venus, along with a new-generation of orbital observatories Spektr-R, Spektr-RG, Spektr-UF and Spektr-M for astronomy and astrophysics research. At the time, a newly appointed head of the Russian space agency, Vladimir Popovkin, said that Russia would return to the old Soviet practice of sending a pair of probes to each destination in the Solar System, thus doubling chances for success of costly deep-space missions. (520) In the first sign of implementation of this policy, the first Russian mission to explore the Sun from its vicinity under the Intergelio-Zond project was promised to be split into two vehicles. 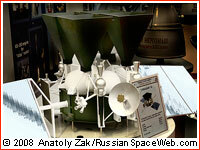 Following the Phobos-Grunt launch fiasco, all planetary exploration and science projects in Russia faced uncertain future. 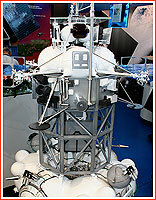 In mid-January 2012, NPO Lavochkin reportedly submitted a new concept of planetary exploration to Roskosmos. As it transpired in the following months, a pair of lunar missions came to the forefront with launches not expected before 2016-2017, while other deep-space missions were pushed into 2020s. Missions to Mars could now be limited to a possible repetition of the Phobos-Grunt project in 2018 as the earliest and to the Russian participation in the European ExoMars launches in 2016 and 2018. The latter mission could be merged with the Mars-NET project. An asteroid-chasing mission, most likely to Apophis, remained in a definition state, with the launch date around 2020, as the earliest. Missions to Mercury and Venus were deferred to the next decade. A very preliminary plan for the exploration of Saturn under the Saturn-TE project was also drafted at the beginning of the decade, but its preliminary development, NIR, was not expected until 2017-2019. A large nomenclature of satellites for watching the Earth and its environment was planned during 2000s, however constant delays and onboard failures pushed most of the hopes to the next decade. 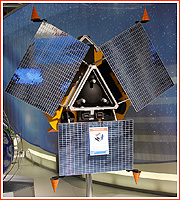 Still, a new generation of satellites developed in the post-Soviet period was finally introduced in 2011, with the launches of the Elektro-L and GLONASS-K missions. Both projects were based on advanced satellite platforms which did not require pressurization to preserve their components, thus promising longer life in space. 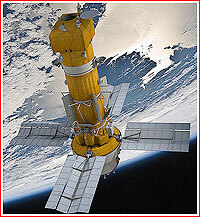 The Russian government put a special emphasis on rebuilding the remote-sensing constellation. 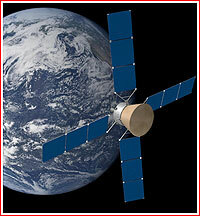 With the launch of Kanopus-V, Zond-PP, BKA and Yubileiny-2 (MiR) satellites during 2012, Russia deployed as many as nine Earth-watching cameras in orbit. A total of 26 remote-sensing satellites were promised to fly by 2020. 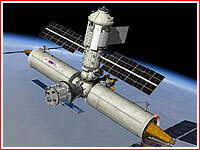 However, the 2012 revision of the Federal Space Program did kill a pair of radar-carrying Arkon-2M satellites, the material-science Vozvrat-MKA capsule, the Koronas-Nuklon sun-watching spacecraft and the ill-fated Sterkh search-and-rescue signal satellite. In the field of satellite communications, the second phase of the Federal space program, covering the period from 2011 to 2015, called for the deployment of 22 satellites, however this goal could hardly be reached. Another major field of responsibilities for Roskosmos extended into strategic missile systems. The agency oversaw key organizations responsible for the production of land-based and submarine-based ballistic missiles, as well as cruise missiles. In February 2011, Russian Finance Minister Alexei Kudrin, promised to triple the nation's spending on defense development from 0.5 to 1.5 percent of the GDP, beginning in 2012. In the course of the decade, some $650 billion were to be spent on the procurement of new weapons, including eight nuclear submarines and Bulava ballistic missiles. Ten divisions of the Russian armed forces would receive S-500 anti-missile systems. 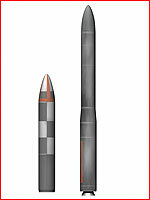 The development of the new liquid-propellant ballistic missile to replace Ukrainian-built R-36M-2s was first announced at the end of 2009, however, apparently, the program was not officially approved until 2011. At the time, a new 100-ton vehicle, was not expected to fly until at least 2022. The development of the project was likely delegated to NPO Mashinostroenia, which previously designed the UR-100 family of missiles. In 2009, Russian Ministry of Defense also resumed funding for hypersonic vehicles, however three years later Russia had significantly lagged in the field behind the United States, Vice Prime Minister Dmitry Rogozin said during his visit to Raduga enterprise specialized in missile systems. He called for boosting the status of hypersonic research projects to the highest priority level. Proposed for FKP-2025 but not included. 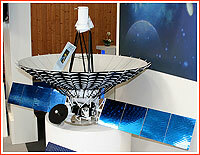 A 750-kilogram spacecraft canceled in 2012. Date Issuing body, document title/subject Document No. Before 2020, Russia promised to introduce a new family of launchers for the next-generation manned spacecraft based on the Russian territory. The program was discontinued in 2011. 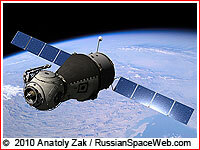 Persona reconnaissance satellite was rumored to be a flagship of the Russian secret military space fleet. Copyright © 2012 Anatoly Zak.